In June, MnROAD, the only cold-weather accelerated pavement testing facility of its kind in North America, begins construction on its third phase of research since 1994, the first time MnDOT has rebuilt in partnership with other states. 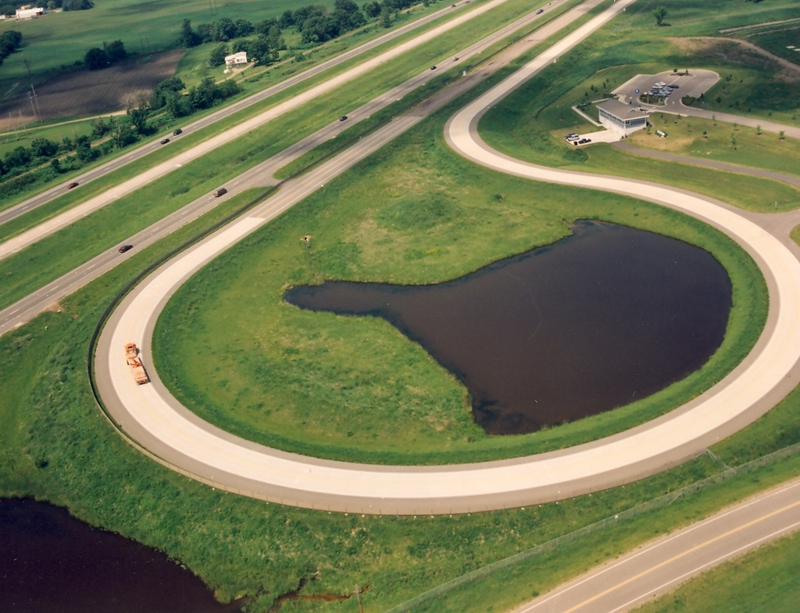 Dozens of new experiments are planned along MnROAD’s test tracks in rural Albertville: the high-volume original Interstate-94 westbound (built in 1973), the mainline I-94 westbound (originally opened in 1994) and an adjacent low-volume road closed track. Six states and numerous industry partners recently formed the National Road Research Alliance (NRRA) to co-sponsor the reconstruction. NRRA-prioritized research will support state and local needs, including effective use of fiber-reinforced concrete, asphalt overlays of concrete pavements, cold central plant recycling and concrete partial depth repairs to name a few. MnROAD has two 3.5 mile test segments on Interstate 94 and one closed 2.5-mile low-volume road. “The advantage of having these test sections at MnROAD is we can take bigger risks and push the envelope in terms of mix designs and layer thicknesses for both asphalt and concrete layers that could not be done on a public roadway,” MnDOT Research Operations Engineer, Dave Van Deusen said. Many old test cells will be dug up. Before any reconstruction starts, however, each test section that is being reconstructed will receive a final forensic study. This allows researchers a look at each layer to see the distress that has occurred over the years—and make the final analysis of why it failed. There are always a lot of theories on the causes of what actually failed, but until the forensic is performed, there isn’t proof on what happened. These findings will help build longer-lasting pavements in the future. The bid letting date for this year’s construction is April 28, but plans were made available for contractors on March 31. This should give the projects more exposure and generate more interest. Construction begins June 5 and continues until November 2017. HMA overlay and rehab of concrete and methods of enhancing compaction – States are looking for longer lasting HMA overlays of concrete. New mix designs were developed to promote long-term performance, including how reflective cracking effects can be minimized through design or other joint treatment. Cold central plant recycling – Other states have used reclaimed asphalt pavement stockpiles into plant mix base course mixes (layers below the wear surface) to effectively recycle these materials in a controlled mix design. How can these layers best be used and what type of surface mix or chip seal can be placed on top? Fiber reinforced concrete pavements – Nationally, states want to get a better understanding of the beneficial use of fibers in concrete pavement layers. Is it worth the cost? How can it be best used in both thin city streets and higher volume roadways? Can it be used in new construction and in concrete overlays? The research will provide the answers. Long-term effects of diamond grinding – Each state has aggregates that have been used in concrete pavements that are considered reactive aggregates. Questions arise as to whether diamond grinding might accelerate deterioration in these pavements. What types of topical sealers can be used to treat the surface after the diamond grinding will also be tested. Early opening strength to traffic – What effect does heavy traffic loading have on the long-term performance of full-depth concrete pavement, as well as fast–setting repairs? Test sections will be loaded by a pickup truck in one lane early enough to produce shallow ruts in the surface. In the other lane, a loaded 18-wheeler will travel over the new concrete immediately after it sets, and then sequentially every six hours up to 30 hours. The long-term effects of these early loadings will then be evaluated. Optimizing the mix components for contractors – What effect do low-cementitious content mixes have on long-term performance and constructability of concrete pavements? Two low cementitious content mixes will be studied to give agencies a better understanding of cost savings. Can these savings be achieved without significantly affecting long-term performance? Compacted concrete pavement for local streets – Compacted concrete pavement is a form of roller compacted concrete that has a standard concrete pavement surface texture. The RCC industry has been successful in Michigan and Kansas constructing CCP pavement on local streets. This research will determine if the texture that is accomplished is durable in harsh freeze-thaw climates. Recycled aggregates in aggregate base and larger sub-base materials – States continue to look for effective ways to recycle materials into unbound bases. This research will add to MnROAD’s understanding of recycled bases and what seasonal strength values can be used for advanced mechanistic designs–and how they are affected by size/gradation. Maintaining poor pavements– Road owners continually have less funding to maintain their roadway systems. What practices should be used for stabilizing both hot mix asphalt and Portland cement concrete roadways when longer-term repairs cannot be done due to funding levels? Partial depth repair of concrete pavements – Agencies continually seek improved materials and methods for the repair of concrete pavements. In this study, up to 15 innovative concrete pavement repair materials will be evaluated on the concrete panels of the westbound I-94 bypass parallel to the MnROAD mainline. Thin overlays-Experimenting with very thin overlays could provide a real benefit for a lot the roads currently out there. The premise is that with thin overlays, the ride can be smoother and the life of older roads can be extended. In one experiment, there is a head-to-head comparison of thin overlays on two sections of road. One section has a thick base and subbase under the asphalt. The other has a heavy asphalt top with very little base. Van Deusen says if they can get an extra five years of life out of road using thin overlays, he would be pleased. Often, he admits, he is surprised by how long these “short-term” fixes actually last. Stay up-to-date on construction by signing up for email alerts at mndot.gov/mnroad. I would like to see an experiment where an old road surface is covered first with a layer of rigid PVC foam. like 1.5 inches thick ,Then covered with standard layer of pavement. 1) insulates the ground so frost doesn’t penetrate so deeply. 2) Distributes load to wider footprint. 3) Adds strength to the road surface.